Colin Hay is a rarity in the world of Rock ‘n’ Roll. He achieved great success out of the gate 35 years ago while leader of Men At Work (“Who Can It Be Now?,” “Down Under,” “Overkill”) but had to pursue a career as a solo artist once the band split in ’86. In 1987, he ventured out as Colin James Hay with the LOOKING FOR JACK album but struggled to maintain success. Next came the Colin Hay Band’s 1990 album WAYFARING SONS, which didn’t fare any better. In 1992, he released PEAKS & VALLEYS, the first in a series of solo albums that would slowly rebuild his career from scratch. Now, three and one-half decades after hitting #1 with Men At Work’s BUSINESS AS USUAL album, Hay is at his peak as a songwriter and vocalist and he shows no signs of slowing down. FIERCE MERCY is proof that he is one of this generation’s finest songwriters. While his hits with Men At Work may have been more ‘immediate’ on first listen, his songwriting is deeper, more passionate and better than ever on this 2017 album. Like his last release, 2015’s NEXT YEAR PEOPLE, this is an album filled with songs that are warm, intimate and emotional. Whether he is singing from experience or as an observer, Hay always connects with the subject matter and it all sounds so personal, which adds to the songs’ power. Lead-in track “Come Tumbling Down” is a sing-a-long that prepares you for the roller-coaster ride of emotions that weave in and out of the rest of the album. “A Thousand Million Reasons,” “The Best In Me,” “The Last To Know” and “Secret Love” are some of the best songs that Hay has ever written or co-written (with Michael Georgiades and others). “Two Friends” (written by Georgiades) features one of Hay’s finest vocal performances to date. Never one to live in his past, Colin Hay has creatively risen above his previous success and recorded what could be his finest musical work to date. 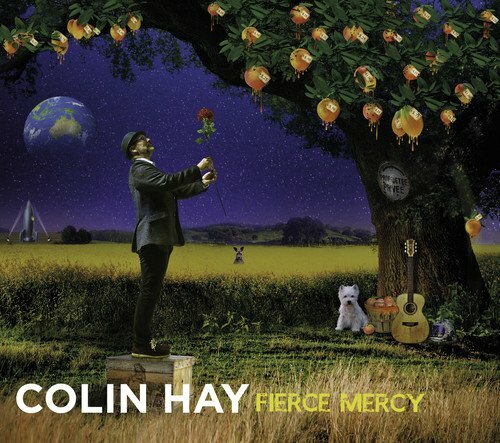 Again, Colin Hay has proven that he leaves pretty much all of his contemporaries in the dust. FIERCE MERCY is a lovely, heartfelt album that will stand the test of time. If you stopped listening after the CARGO album, you’ve got a lot of catching up to do!